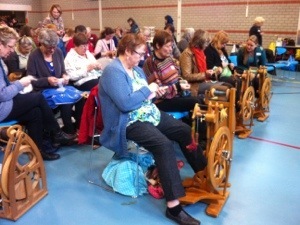 Here in the Netherlands, rather than having a ‘guild’ as such, we have a National Spinning Group organisation, (Landelijke Spingroep). They send out regular newsletters, keep registrations and a list of all the local spinning groups, and organise an annual spinners weekend party. 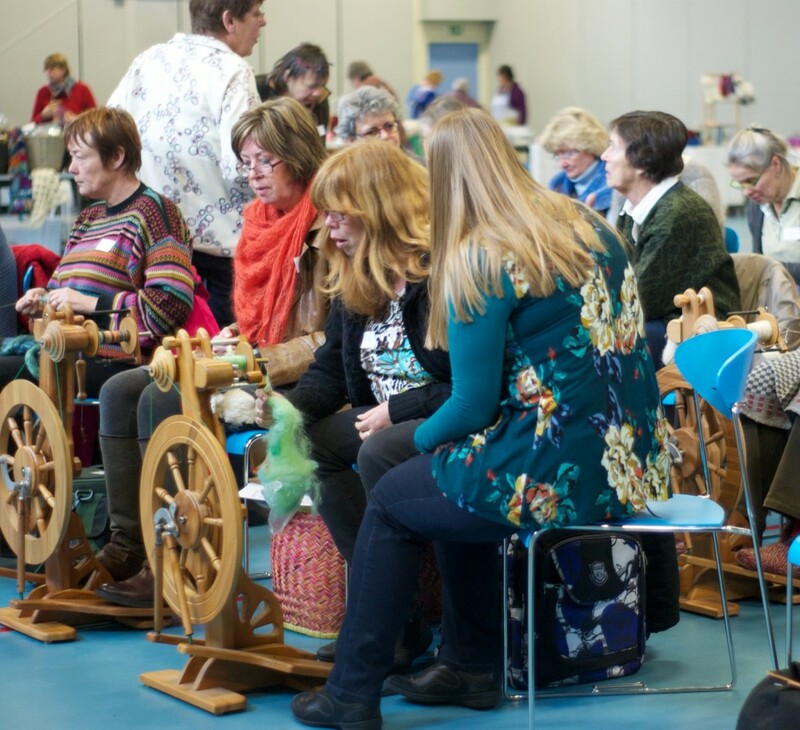 They also arrange demonstrations and keep a presence of spinners at many events around the country, and generally work to coordinate activities for us and share information. Yesterday was the AGM. 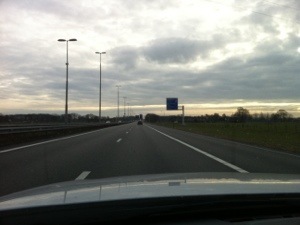 I had to get up pretty early to drive to Arnhem but it was worth it! Of course, when you get THIS many spinners together in one room, you also have to do more than talk, so the first part of the day involved rows and rows of people with wheels whirring, pausing only to hold up red or green cards at appropriate times as we worked through the agenda. As I reflect on this experience I can honestly say this was probably the most productive meeting I have ever attended! Something else that was quite interesting to me, as a New Zealander living inside the Dutch culture, was the experience of the famous Dutch directness at its best. People are not afraid to stand up and say what they think in quite a direct manner. Sometimes this may seem a little… inappropriate to someone from another culture, depending on the situation and relationships, but in this meeting, even though there was very little disagreement on any of the points, it became clear to me that, by the end of the meeting, it was easy to be confident in decisions and votes, because you just ‘know’ that if anyone had something to add they would have done that, leaving no resentments or hidden agendas. At least, this is my interpretation! Now comes the really fun part, after the official meeting ended, and lunch was consumed, all the stand holders opened for business, and the demonstrations began! 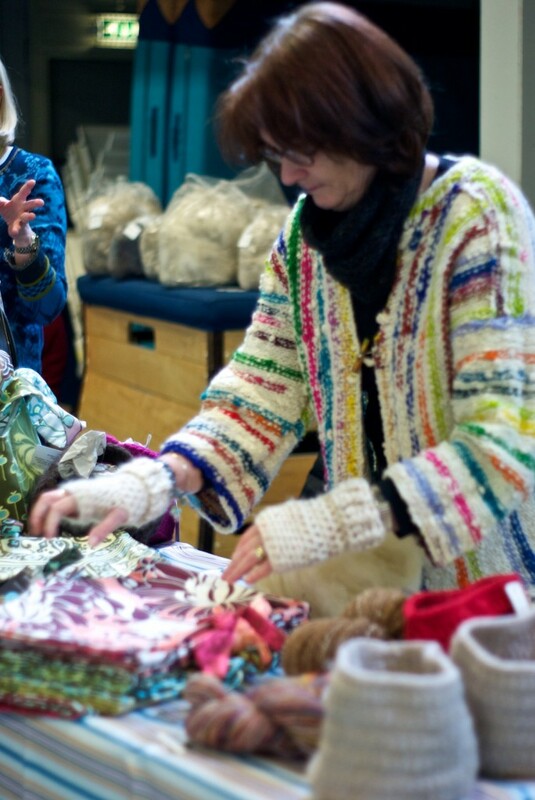 Esther and I were there to demonstrate art yarn spinning and I had also been asked to bring my hackle to demonstrate. Apparently the video I made some time back had caught the eye of the organisers and they thought it would be interesting for members to see, and I was very happy to note the interest in what I was doing with it! I took some bright rovings in pinks and oranges, and angelina of course, and started blending and dizzing the roving. People were really surprised at how easy it is to do! I hope it inspired others to try it as well. Most were impressed with how quick it was to create a beautiful lofty roving that really looked good enough to eat! If you are considering getting your own hackle, Majacraft make beautiful ones (at least, if you can call something that HAS to look like an ancient torture device beautiful!). I use mine primarily and simply for blending colours from roving or top, and adding sparkle into it, but you can also use it in combination with your hand combs for fiber prep. In Holland you can order through Alet. The cool thing for me from doing the demo, is I have re-inspired myself to make more rovings this way! I especially love to corespin the results, as you can really make great use of the striping thats achievable in handmade roving. 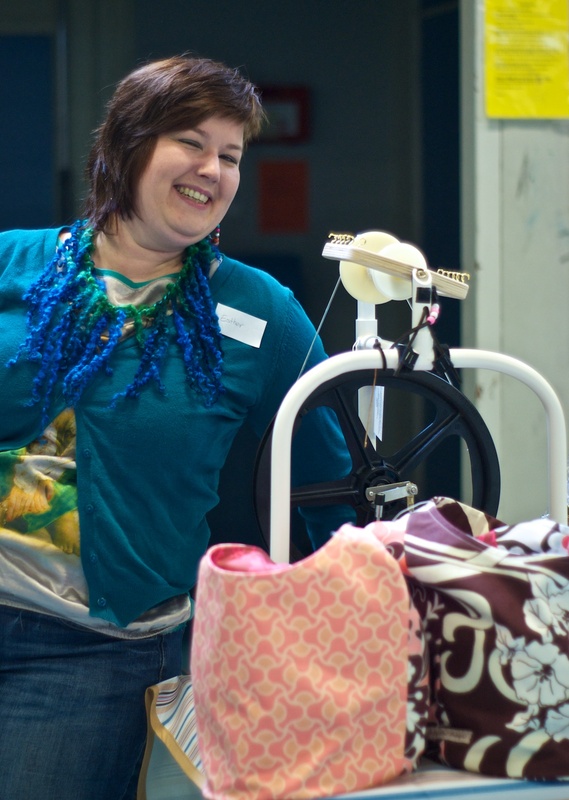 In fact, I am going to make this the subject of my next newsletter – corespinning and making striped roving! My very distinctive Aura was also much admired, and I was impressed to see the entire front row of spinners at the meeting looking like the Majacraft Rose division of the club! 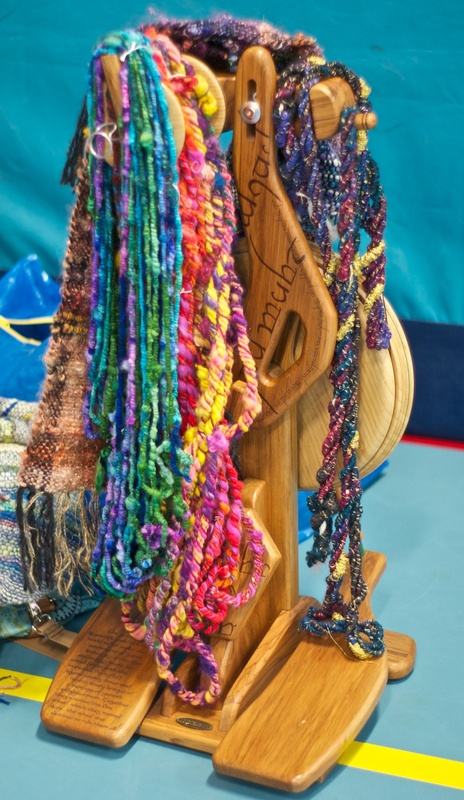 I made some yarns while I was there, one as a corespinning demo and made from a batt in blues, and the other from the roving I dizzed off the hackle on the day, which I started spinning there and finished at home. It was only afterwards when I put them together that I realised the colours were the same combination as those I had just used in paint on the blending boards I am making. Maybe its not coincidence, maybe my colour picking is being guided by a subconscious wish for deep blue skies and sunshine.. but I promise, I had no idea I was doing this till I saw the two yarns side by side! So thats pretty much now they do it in Holland anyway, there are many aspects that are universal to spinners and fiberistas, the enjoyment of spinning together, the sharing of ideas, inspirations, and the excitement about what we love doing, the market, the discovery of just the right fiber or dye colour and the innovations people come up with and share with others (and Hetty I am thinking of you here specifically!!) It all just reinforces my ideas about the spinning community as a global community, how can it not be, when we have so many things in common, regardless of language, culture, or location! I think this is my favourite photo from the whole day! The yarns are so beautiful. I love the coiled blue one especially! that was a nice story about the Dutch way Suzy, I always love to hear how we Dutch are different from other country’s for there is always a lesson in it! You know I agree the weaving thing being the next thing in fiberland! 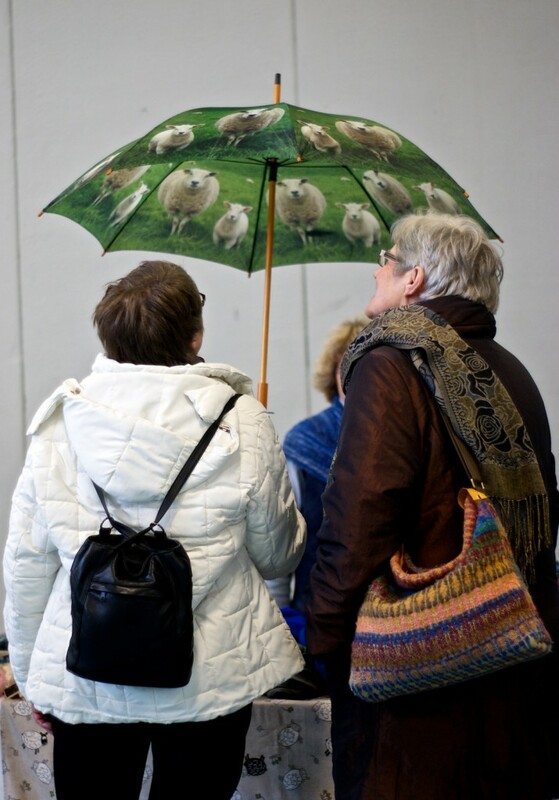 Did you tell the spinners that you will weave on the 20the of May in the Schaapskooi in Ottoland? 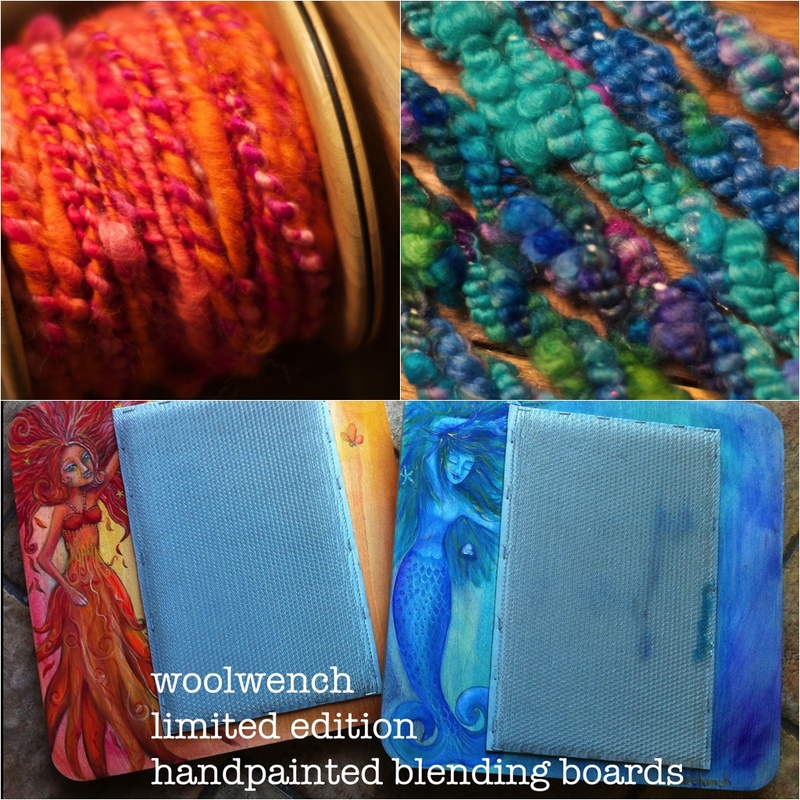 I hope to see a lot of fiberaddicts there! It’s great to have you here in the Netherlands girl! Thanks Marijke 😀 I am really looking forward to the Schaapherdersfeest!! Monique you must! And I just visited your site and am in awe of your work, so beautiful! Thanks for sharing! It was a great day, and you being there was definitely a great addition! I had such a good time 🙂 thank you so much for suggesting the hackle, not only so I could share the ideas for blending with it, but also to meet the person I bought it from (via Marktplaats!) that was so funny!, Another time I would love to bring a loom too, I think it was interesting for people to see those chunky art yarns incorporated into a weaving, and I will be doing a lot more of that this year. I’m excited to see the striped goodies! Wow! That was very interesting – a sight to see I am sure!